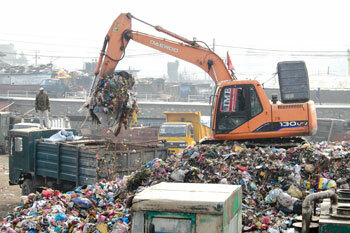 Six years after announcing a tender to sub-contract the management of Kathmandu’s waste to private companies, the government finally gave its nod to two firms this month, the first time garbage disposal has been given to private firms. Nepwaste and Clean Valley Company are preparing a feasibility plan to collect, recycle and dispose the nearly 1,000 tons of trash that Kathmandu Valley residents throw away every day. The rubbish can be turned into a viable business because 60 per cent of it is organic, which the companies can turn into commercial fertiliser, and recycle the rest of the plastic and metal. “Kathmandu’s garbage situation has reached a crisis stage and we now need to start planning for the long term, and involving the private sector is key to achieving that goal,” says Sumitra Amatya of the Ministry of Urban Development’s Solid Waste Management Technical Support Center. Nepwaste, a joint venture of Finland-based Compunication, Poyry, Bioste and the Dutch-Nepali enterprise The Organic Village will be involved in Kathmandu. The Nepali-Indian joint venture Clean Valley Company will focus on Lalitpur, Kirtipur and Bhaktapur. If the Detailed Project Report shows that the firms are technically and financially feasible, project development agreements will be signed to manage solid waste. The 2011 Solid Waste Management Act sets regulations and fines for transgressors and requires every household to sort waste, but enforcement has been weak largely due to unclear guidelines. Lasse Laaksonen of Compunication says, “The most common problem in Kathmandu is segregation of waste. Very few households do it themselves, but with our technology waste can be sorted mechanically.” At present, only half of the Valley’s biodegradable waste is turned into compost. Once the companies finish their feasibility, they hope to show that the cost of garbage collection and disposal can be reduced, and the amount of garbage that ends up at the landfill site will also be lessened. At present the Kathmandu Metropolitan City (KMC) spends 10 per cent of its annual budget (Rs 500 million this year) in transporting waste from its collection centre at Teku to the landfill site in Sisdole. Companies like Nepwaste and Clean Valley know there is cash to be made from trash, and the Finnish group has experience in managing waste profitably in countries including Germany and Sweden. Glass and metals like aluminum and iron can be reused and recycled while 90 per cent of plastic and paper can even be converted to diesel. The organic waste can be turned into compost. Without a mechanism to segregate waste at source, most of the organic, recyclable wastes at present ends up in landfills. The only form of segregation is done by scavengers who collect plastics and other resalable materials from the site. 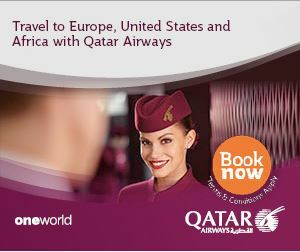 “Maximum material reusability is the key. Everything will be used optimally and turned to electricity, fertilisers, oil through environment-friendly processes,” explains Laaksonen. With increasing per capita waste production, the current mechanism of collect and dump is not going to work for long. The only functioning landfill in Sisdole is almost full, and the long-term disposal site in nearby Banchare Danda has not been completed even a decade after it was started. Have you ever wondered what happens when you dump your used broken laptop into the neighbourhood garbage pile? Or toss an old mobile into the trash can? Computers, televisions, stereos and phones are electronic products that are not like any other waste because so much of it can be reused, refurbished, or recycled, and if it is not disposed of properly, it can contaminate the environment with heavy metals and toxic substances. “With every individual now owning two to three electronic devices, e-waste is emerging as a problem. Without a proper mechanism for disposal, they can be hazardous,” says Sanjaya Nath Khanal, professor at the Department of Environmental Science and Engineering at Kathmandu University. E-waste should only be disposed in the landfill after they have been dismantled and the reusable and recyclable parts have been separated. Metal and plastic scavengers do go through Kathmandu’s garbage extracting silver, gold and aluminium before it is taken to the landfill site, but they usually leave behind the parts with the toxic material. Most electronics contain toxic substances including lead, mercury, beryllium and arsenic. Exposure to these substances can cause damage to both human health and environment. According to Rabin Man Shrestha of the Kathmandu Metropolitan City, people still do not throw their old electronics with other household waste. “People usually tend to keep it at home or sell it to the recyclists because these things are valuable,” he says. Dumping has become controversial because of some e-waste being ‘exported’ to African and Asian countries as ‘second hand computers’ that are actually being dumped for disposal. You can smell the stench even before you crest the ridge and drive down the other side to Sisdole, the little hamlet in Nuwakot that has now become synonymous with garbage. 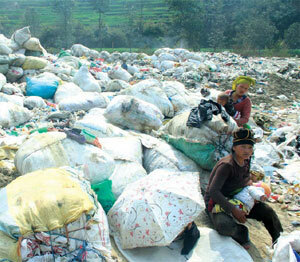 Sisdole is Kathmandu’s landfill site, where everything we throw away eventually lands up. All along the dirt road, there are bits and pieces of plastic, an odd sock or old jacket where they fell off the trash truck. Along the way, a group of children have blocked the road with a bamboo stick balanced on old suitcases, asking for money for Shivaratri. They have learnt well from Sisdole elders, who this week have once again closed down the landfill site demanding more compensation from Kathmandu for the privilege of throwing its trash in their neighbourhood. 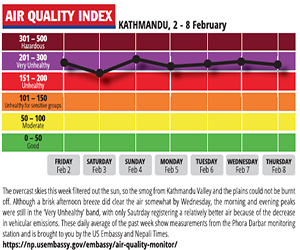 Garbage is once again piling high on the streets of Kathmandu this week. “We got the suitcases from the dumping site,” says 11-year-old Amit Balami, playing with his cousin Ramit. The boys plan to take the suitcases they salvaged home to play with the other ‘toys’ they found in the dumpsite. Sunita Tamang, 25, rummages through the trash heap, sorting bottles and other recyclable material as her sick five-month-old son sleeps under an umbrella beside her( pic, above). Her three-year-old son Ashish is playing nearby. “I suffer from a cold now and then, I don’t know if it is the garbage that does it,” says Tamang. “We need the money from recycling, we’ll move once we earn enough.” She earns Rs 4 per kg of everything that is sent for recycling. Sisdole is just 29 km from Teku Transfer Station in Kathmandu, and over the years the 600 tons of garbage that lands here daily has nearly filled up the deep ravine. Environmentalists have warned of contamination of the ground water, and locals fear disease from the rotting trash. Climbing up the landfill with his goats, 20-year-old Gopal Shrestha remembers a different Sisdole from his childhood. “There used to be terrace farms here, now it is all waste and there are flies everywhere,” he says. Livestock often die grazing among the refuse because the landfill area is not fenced in. On the dusty road, Tanka Nath Neupane and Madhav Neupane recall the agreement the village made with the Kathmandu Municipality. “When they came to us, they said it was for only three years, they never kept their word, and they dump it haphazardly,” he adds. The municipality also promised to build 3 km roads every year, and that promise hasn’t been kept either. The household near the landfill receives a small compensation from Kathmandu, but locals complain that it is not distributed equally. Neupane tells us: “All I know is that the landfill has to be moved elsewhere,” A yellow garbage lorry comes up the road, he flags it down and hitches a ride into the city. Do you know your street and house number? "The last thing we expected in Nepal"